Living rooms are always built for multiple purposes, they can be set as waiting rooms, meeting rooms, family sitting rooms and also as media rooms sometime! Whatever may the purpose of sitting in living room, the living room sitting plans always include a central coffee table, help the sitting members to eat and to make gossips at the same time! Being in arm-reach of all the personages sitting around it, it can even hold the mobile phones, books, news paper and even the beverage mugs or glasses to speak with gestures of hands! 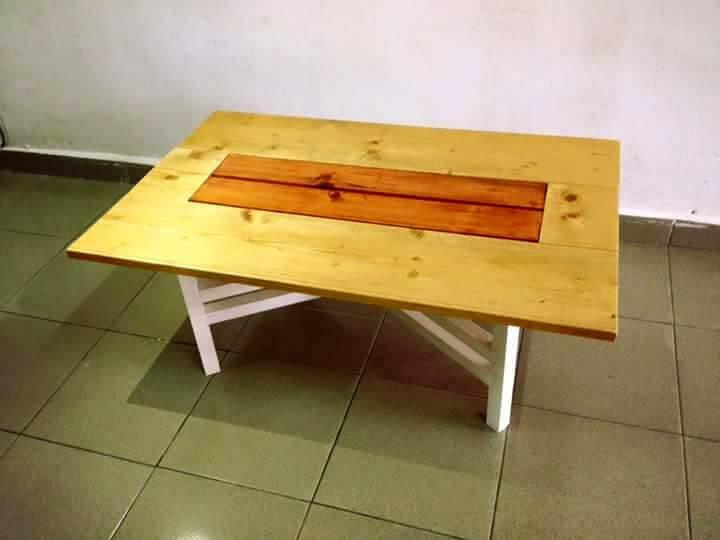 For all style loving homey persons, we have brought here this stylish DIY pallet coffee table having removable criss cross base or legs! The top of this coffee table has been built from longer straight wooden planks got separated from pallets, comes with an accent wooden inlay done with 2 single pallet slats having dark choco tone of wood! 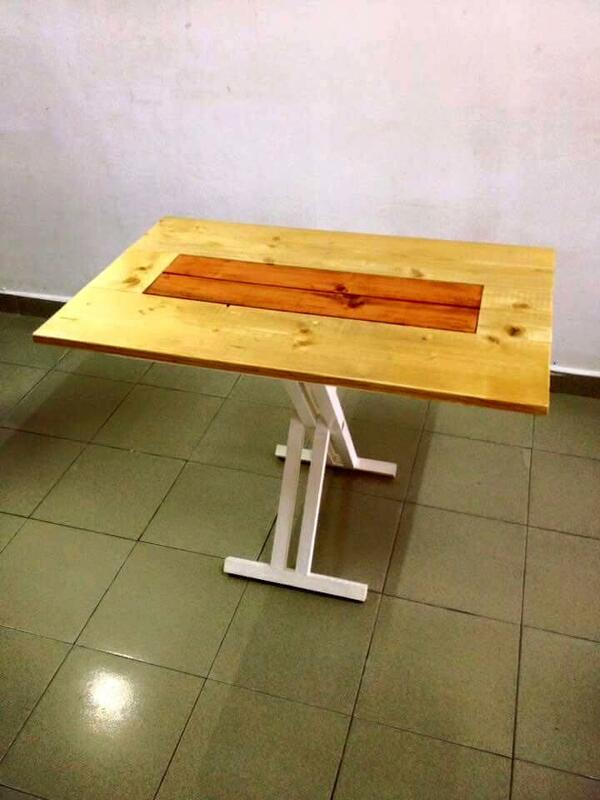 Criss cross base is also pallet-made and can hold the tabletop in two different ways as shown, hence you can also vary the height of the pallet table! 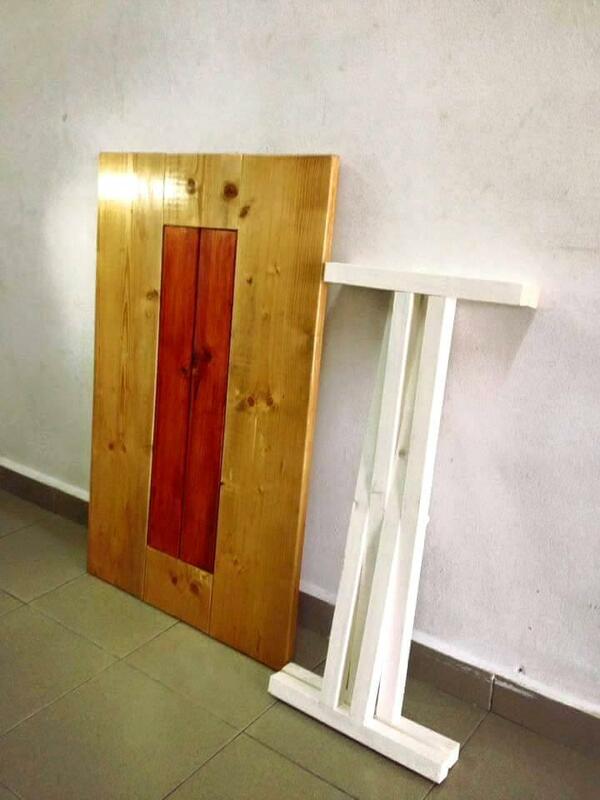 Longer reclaimed planks of wood, made sleek, holds well the two slim planks inside as an accent inlay, this gives the tabletop top an extra pop to be more stylish! Building the removable and criss cross base is something here that is trickiest part of the construction, two I-shape beams of pallets, each made of two thicker wooden planks, have been pivoted together by joining their central positions, the most amazing think is that they can pass through each other! You can vary the alignments of criss cross bases to vary the look of the table! 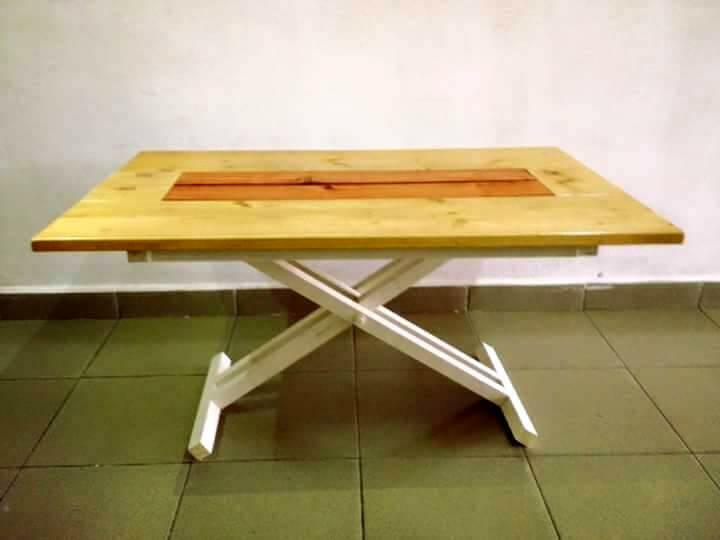 Put flat the base and make the table sit on it as a 4 leg table! Let the base stand vertically under the top as a stylish 2 leg table as shown here, you can also adjust the criss cross base to any angle to vary the height of the table, a big plus point here! So due to amazing variations in the height, table can serve for multiple purposes, it can even be decided as a two people dining table along with a centerpiece coffee table in your living room! This portable edition of coffee table would also be too easy to carry with while going on a picnic!